Mac Stories reports that the new service went live for Apple Store employees on Monday morning. The Concierge app will send a push notification to employees when a customer uses an iOS device to check in to the Apple Store, wrote author Cody Fink. From the app, employees will be able to monitor an 'iQueue' with a list of currently waiting customers and their respective check-in times. Store managers will also take advantage of a new app called Scout that will allow them to assign room-by-room check-in locations for "accurate, close proximity check-ins." Scout is designed to be a one-use application for "initial set-up of Apple's location based services," the report noted. 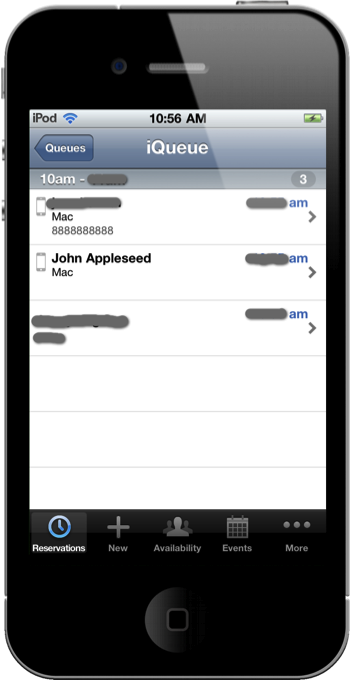 Photos obtained by Mac Stories show the rumored Concierge app in action. Although the "iQueue" waiting list image appears to be a mock-up, as the display reads iPod despite clearly having an iPhone 4 body, Fink posted an update clarifying that he received the screenshots without the iPhone 4 frames and "used a utility to wrap these images for presentation." 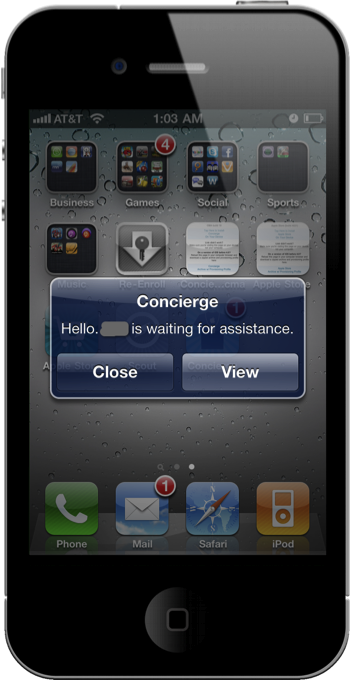 The Concierge application should work on both in-store iPod touch and iPhone devices. Apple currently uses an "EasyPay touch" system in its stores, combining custom software, an iPod touch, a magnetic stripe reader and advanced barcode scanner. According to the report, Apple will update its Apple Store application to send a push notification as customers enter the store asking them to check in. 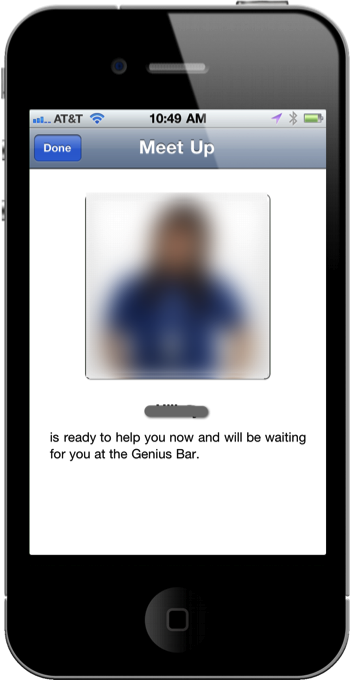 The app will then notify customers of their position in line and send a photo of the employee who will help them. Although Mac Stories is unsure exactly when these new features will roll out to customers, the updates will likely come "soon," Fink wrote. 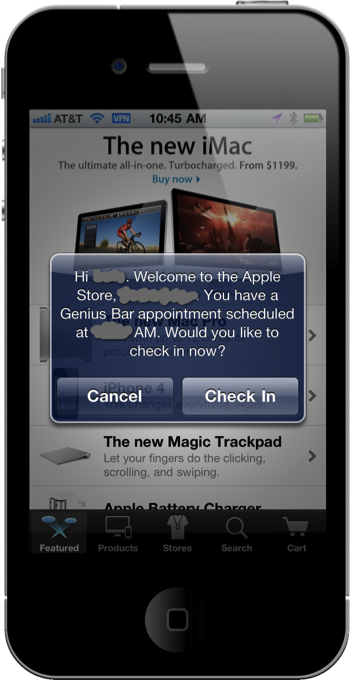 According to the report, "Apple Store managers were flown in and treated to the initial location based concept" at a recent conference in Los Angeles, Calif.
Sources told AppleInsider last November that Apple was developing a Concierge application for its retail stores but did not provide a release date for the app. As Apple continues to innovate with its retail stores, the company's retail strategy remains highly successful, bringing in a record $3.5 billion in sales last quarter, up 75 percent year-over-year. With 317 stores worldwide as of the end of September, average revenue per store for the quarter was $11.8 million, up 52 percent from last year. "We see great opportunity to continue our retail growth," Apple CFO Peter Oppenheimer said of the coming fiscal year during the company's fourth fiscal quarter 2010 earnings call last week. Apple expects to open 40 to 50 stores in the next year, with more than half of them overseas.